In memory of little Pico. 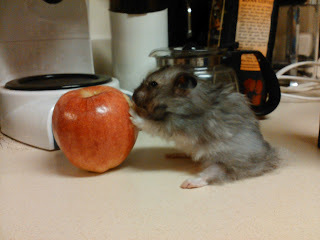 Following an all-night vigil with my hamster, Pico, he passed away this morning. Why is this important? One: I love my pets more than I like almost anyone else. 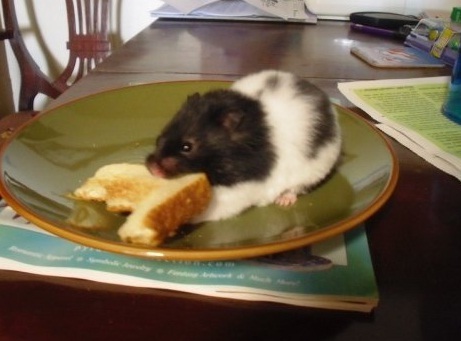 For a long time, it seems, my pets and my hamsters were my closest friends and I get very attached to them. Two: Pico was a unique, special hamster. He was smart and expressive, not to mention adorable. Three: I have known him all his life. I bought his mama, Raya, March 6, 2009. 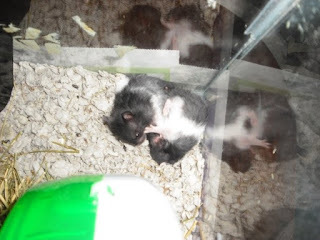 She had babies two days later and I ended up with a little family: Raya, Gary, and Pico. I got Raya during a time of my life that was very difficult for me. It was shortly after the divorce of my parents, which I struggled with for a long time. I had left the college and roommates that I loved and was going to a school I hated with people I hated. Not long before, I had moved in with my mom and we were having difficulties concerning the divorce and her now-husband, Jake. Raya means "friend" in Hebrew. And boy did I need one. She was so pretty and interactive. As soon as I put my hand in the cage at the pet store, she came to me and climbed on my hand. It was love at first site. So she came home with me. Smart little thing figured out the most efficient way of chewing out of her carrier box before I got her home to a cage. Two days later, the boys were born. Raya wasn't the most attentive mother, she was more of a people-hamster, I suppose. They were so cute as babies. The fact that they were a bit inbred didn't show up until they were older. Pico was the runt and outwardly the most inbred, but Gary got sick several times during his life. Babies! The one with more white is Gary. He looks a lot like his mama. Bombarding mama while she is trying to run in the wheel. Almost exactly a year ago, I lost Raya. That hit me very hard. A little over a month later, Gary died. That was a tough one; he was sick and I stayed up to hold him until the end. I still get sad, thinking about them. Especially Raya as she marked an important turning point in my life. 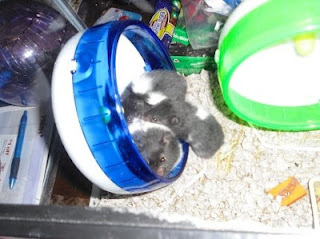 I focused a ton of my time and energy on them, taking them out to be held and run in their hamster balls, cleaning cages, administering medicine and electrolytes... But they were all well-behaved (well, Raya could be a little rebellious and Gary did get awful tired of taking so much medicine, poor thing, but he always did without too many complaints and without any biting). They were a big part of my life. 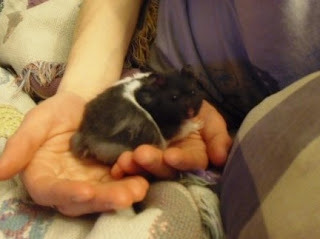 Pico, the mildly deformed runt lived on. He never got sick, even when Gary and Raya had bouts of a very contagious disease. Despite this, he took the medicine I gave him with no complaints (just in case. He never put on weight like the other two so had no reserves if he did get sick). He never bit me, even when I smelled like food or startled him. He was always sweet and gentle, even to the end. He was smart, too. I know that people probably won't believe me when I talk about brains and personalities of hamsters, but I spend an awful lot of time with them. Pico. He had bat ears. And see the funny long tufts of fur? He and Gary both had those; a sign of inbreeding, I'd say. Three years is about the maximum lifespan for a hamster. 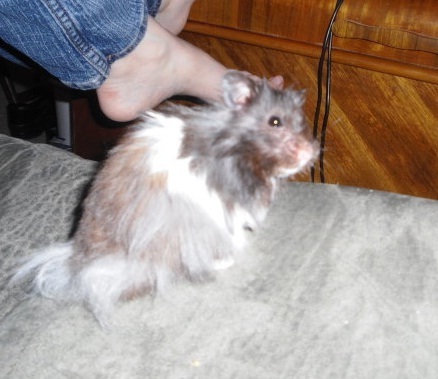 Pico is probably the oldest I have had (I'd say about 100 in hamster years). At about three, he began having problems: his back legs slowly stopped working. He could barely walk, but he still wanted to come out and run around. He could always tell when I was nearby (I'm sure he couldn't see well, if at all). If he wanted out, he came to the door and let me know by raising his paws. If he didn't, he would stay where he was. As the last couple months went by, he stopped being able to open his eyes and he could barely walk at all by the middle of May. Isaac would often go to his cage and ask "Still alive, Pico?" But I was convinced that he had something worth living for. Sounds silly, I know, but it sure seemed that way. And despite his decrepit condition, he crawled his way to the door to ask to be let out a few times. I am still convinced that he wanted to stay for me. When I came home last night, I thought he was dead. When I petted him, I could see him breathing more (I could swear he was barely breathing when I got home, if at all). So I took him in the cage bottom with me and stayed on the couch with him all night, petting him and touching him and talking to him. During all of this, Isaac and I were having some disagreements. I suppose I shouldn't get too upset with him as he's never had many pets to get so attached to, but it's difficult when you are grieving. I'm sure he, like many others, doesn't understand how I could be so attached to something so small and ephemeral. I suppose I have a very soft heart. Maybe too soft. ("Her hand that was holding Calcifer squeezed... Howl and Calcifer both screamed. Calcifer beat this way and that in agony. Howl's face turned bluish and he crashed to the floor... She stared at Howl. 'He's faking,' she said. 'No he's not!' Calcifer screamed, twisted into a writhing spiral shape. 'His heart's really quite soft!'" ~Howl's Moving Castle by Diana Wynne Jones.) Even though he is a little rodent, that doesn't mean I can't love him and give him a good life, right? So Pico lived all through the night, breathing steadily, but not rousing. Isaac got up and went to work and I stayed on the couch with him. I share my love of animals with most of my family and had already alerted my mom to Pico's condition. She came over and sat with me while I held Pico and cried. Then, once she was there, he took his last breath. I know this sounds silly, but indulge me: I think he was waiting to make sure someone was there with me. I know Isaac was there last night, but he didn't sit with me and comfort me, so I think Pico wasn't going to leave. Once he knew I was in good hands, he left. Call me crazy, but I believe this. Maybe if you knew Pico as well as I did, you would, too. So I cleaned out his cage and put all of his things away in a box. His little body went into it's own bedding-lined box and we took him to the vet to be cremated (you have my permission to think I'm insane if you like, but living in an apartment, I have no place to bury him and I refuse to throw away something I love so much). Dropping him off was very, very heart-wrenching for me. It's so final and I can't explain it, but I almost felt like I had betrayed him in some way. I came home and tried to do a few chores, but really had no heart for it. I never realized how much I talked to him and looked in on him until he wasn't there. I would get up to go to the kitchen or bedroom or bathroom and I used to stop at his cage all the time. It feels very empty there now. Later, my mom came back and she and her husband brought me the little bunch of pink roses shown above. It was very sweet. I put them on the table where Pico's cage used to be. That was shortly followed by texts from my sister and brother. They are sensitive to things like this, too. I guess you can tell we are related, right? I have the best family. They don't think I am nuts and they have a lot of sympathy for me. It was nice to know that they were thinking about me. So thus concludes the end of an era. (I thought so in those terms as I sat watching over Pico and my mom said the same thing after he was gone.) I miss all of the pets that I lose. They mean so much to me and, in their own little ways, do so much for me. Raya and the boys were good for me and came during a time of great need in my life. Little Pico stayed longer and he took good care of me. I will miss them all, and I will miss Pico. Time to begin a new era. Thank you Pico. Love you all. Pico and his 3rd birthday apple. March 8, 2012. "Let this be my final lesson. Everyone and everything has a time to die." ~Sabriel by Garth Nix.